Last Friday Paul and I went to see Philip Glass's gargantuan minimalist classic Einstein on the Beach at the Barbican Theatre. We loved it. Agreeing with most of the critics. However... well, let my letter to the Barbican do the talking. I am writing to complain about the behaviour of production staff during the Philip Glass's Einstein on the Beach performance last Friday night 4th May 2012 at the Barbican Theatre. My friend and I sat in row S in seats 11 and 12 and directly behind us in row T were four men and one woman who talked loudly throughout the whole show. Initially we believed that they were customers like us - it then became apparent they were actually production staff. We asked them to be quiet. They ignored us. This behaviour continued throughout the whole performance - all five hours of it. Other patrons were also affects by this and moved away. Others asked them to be quiet - again these requests were ignored. There was no member of Barbican staff that we could find to complain to on the night. This was very frustrating. I understand that technical issues do need to be addressed during performances but not at the expense of paying customers. My friend and I had waited 27 years to see such a landmark cultural show, we had been looking forward to the great music, ambitious staging and were happy to pay £100 for each ticket. However this performance was ruined for us due to the production staff talking throughout the show. I am a Red Member , attend events at the Barbican frequently and have never had cause to complain about any aspect of the Barbican's usual excellent service. However on this occasion we both felt severely let down by the Barbican. I feel the need to draw this to your attention so other patrons don't experience similar incidents. There's a sort of happy ending. 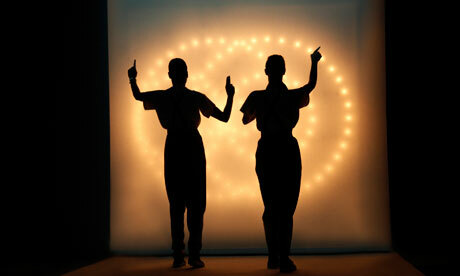 The Barbican called me to apologise explaining that it was actually the director Robert Wilson behind us. They have offered me two free tickets for this Friday so I'm going again. To enjoy the opera in the way I imagine Mr Wilson intended. In peace. Did you read/hear about Theatre Critic Mark Shenton's spat with a member of the audience for taking flash photographs during the performance? Yes, you just can't get the audience members these days! These have a bad status but even if you might find the odd calamity they are often preferable to most portaloos. This is since there are because they are used faster. They are uncovered to the open air and consequently smell is less of an issue. They are also in general lit.